There is really nothing quite like the berry-citrus combination. Bright, summery and sweet, it packs the perfect sour punch to balance out the ripe berries, all in one perfectly sunny loaf. Another recipe from THE Deb Perelman, which I had trouble resisting after the smashing success I had with her grapefruit cake (all 4-7 times, as I have now lost count how many times I've made it). 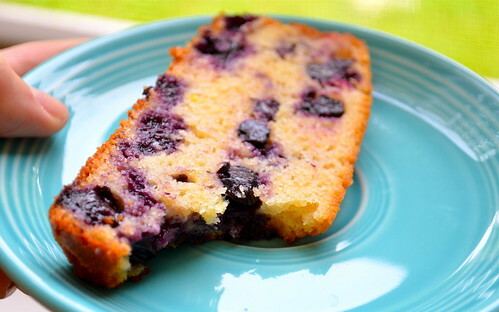 Also the fresh blueberries I had were practically shouting, "Bake me into something lovely and light, it's my purplish-navy destiny," and who would I be to argue with that. Though I normally balk (yes, balk) at the taking of fresh fruit, mixing it into a batter or folding it into a crust, covering it with sugar and baking it at 400-plus degrees (because, I ask you, WHAT is better than fresh, seasonal fruit when it's FRESH? ), Deb has a way of making me believe. Do I have to mention the grapefruit cake again? Preheat your oven to 350 degrees. Grease and flour an 8 1/2 by 4 1/2 by 2 1/2 inch loaf pan, lining the bottom with parchment paper. Grease and flour again. 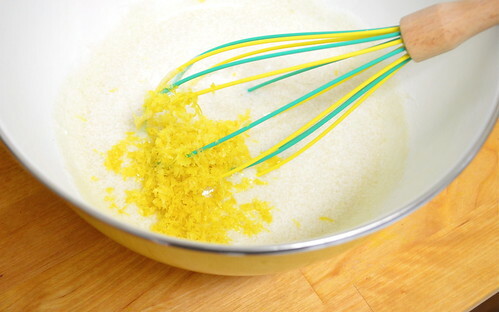 Whisk together your flour, baking powder and salt into one bowl. In a separate bowl, combine your yogurt, 1 cup of sugar, lemon zest, vanilla and oil. Slowly add and whisk your dry ingredients into this zesty-sugary-yogurty combination that is by now smelling heavenly. 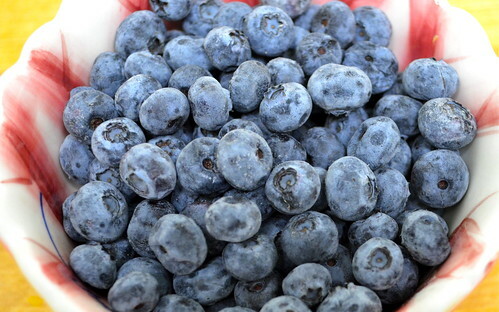 Once these two bowls are combined, gently fold in your blueberries. Pour your batter into the prepared pan and bake for about 50-55 minutes until it looks all lovely and golden, or until a cake tester (okay, toothpick) comes out clean. 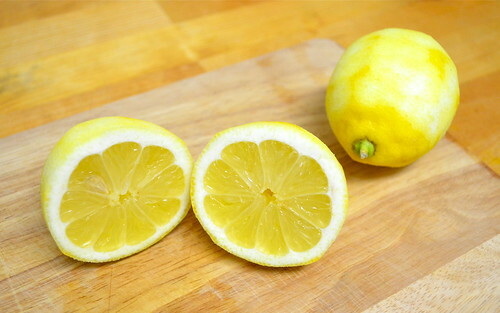 Meanwhile, heat your lemon juice in a small pan over low heat. Add your tablespoon of sugar and stir constantly until dissolved. This will happen pretty quickly, so feel free to stay put and stir, stir, stir. 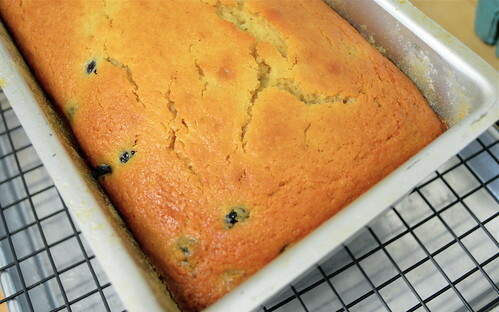 Once your cake is done and has cooled for about 10 minutes, flip it out onto a cooling rack. Place this rack over a baking sheet or another wide platter (preferably one with edges). Poke a few holes in the top using a toothpick, then pour your lemon-sugar mixture over the cake. This gives it that extra lemon ain't-no-mistaking-it pow and I love it. Let cool completely (suchhhh a joke), then serve. Over and over and over.